For Slaw, combine coleslaw mix, onion and bell peppers in large bowl. Combine dressing, cilantro and lime juice in a small bowl; toss dressing mixture with coleslaw mixture just until all ingredients are well coated. Refrigerate, covered, until ready to serve. For pork, prepare grill with medium-hot fire. Combine barbecue sauce with chipotle chiles. Brush tenderloin with garlic-flavored oil. Grill 8 minutes per side, or until meat thermometer inserted in thickest part reads 150 degrees F. Brush tenderloin generously with barbecue sauce mixture and grill a couple more minutes, about one minute per side. Let tenderloin stand 5 minutes before slicing. To serve, place slaw in center of platter. Surround with sliced tenderloin. Remaining sauce can be served at the table. *Wear rubber gloves when handling hot chiles. The slaw can be made up to three hours ahead for this spicy dish. 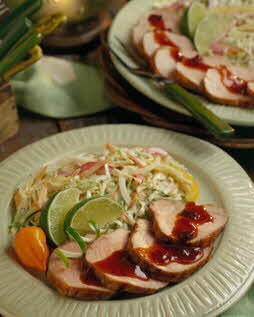 The slaw is a great partner for spicy pork. Serve with fresh seasonal fruit and plenty of iced tea.